All the latest 7th Saga snes cheats, game genie and action replay codes for 7th Saga on the SNES are here in this article. 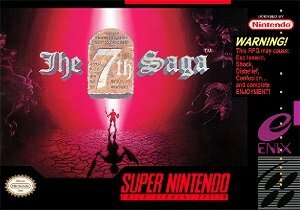 7th Saga on the SNES / Super Nintendo is a very challenging game and can be quite frustrating to complete, Hopefully using the below cheats and codes will help you to beat this game. If you use these cheats or know of any cheats or codes I have left out please let me know about it by posting a comment below. Level Up Fast : After you get to Zellis, raise your character up to level 16. Follow the mountains west of Zellis until you get to where the mountains are right beside water. Stay at the very bottom part. You get to fight Brains, B. Demons, and other enemies near Pell. I got my character up to level 18 in about a half an hour (it helps if you have Lux). If you are Lux, get a partner that is good with Magic (I would pick Esuna and keep using Ice and Ice 2). When you get low on mp and/or hp, go back to Zellis and heal yourself. Keep doing this until your at level 20-22. Then go to Melenam and beat Red Pison. Infinite Stat Boosts for Lux : If you have Lux as a playable character, it can receive a stat boost at a certain point in the game during a cutscene. While this cutscene plays, make Lux walk to the right (press Right on D-pad) into a wall. At this point Lux will gain a stat boost, but if you let go of Right and quickly press it again, you can trick the game into giving you a boost to another stat! Repeat as much as you’d like (or are able to). Infinite Stat Boosts (Lux) : In the past, with Lux in the party, he is able to get stat boosts for 30 HP, 30 MP, and 20 of the remaining stats. While this cutscene occurs, you can walk four steps. During those steps, if you walk out of bounds (like through a doorway) as the dialogue box appears, you will get the named stat boost. Here in particular, you want to walk right to the wall, let go of Right briefly, and then press it again quickly. By doing this, you can still get another stat boost, with the previous one having already taken effect! Defeat Romus in 1 Turn : First let Romus kill you, then back in Rablesk and find a man with an upset wife. He will give you a Whistle. Go back to Romus and right at your first turn use the Whistle and he dies instantly. Just remember if using this tip it will cost you half your gold. There are a few things you can unlock in 7th Saga they are listed below. If you are lucky enough to own an action replay you can use the below codes in 7th Saga on the SNES. If any of the codes do not work, or if you know of any that do work that I did not mention please post about it in a comment below. If you are lucky enough to own a Game Genie you can use the below codes in 7th Saga on the SNES. If any of the codes do not work, or if you know of any that do work that I did not mention please post about it in a comment below. If you are playing 7th Saga on Snes9x (Or another SNES emulator which supports cheat codes) there are a ton of cheat codes you can use. You can basically use any of the codes listed under the Action replay codes + Game Genie Codes sections, you simply need to enter the required code as per below. Question : Can I use all of these 7th Saga SNES Cheats? Answer : The cheats I have listed under “Normal 7th Saga (SNES) Cheats” can be used by everyone. You will need a Action Replay or Game Genie to use the cheats listed on this page. Question : Do the 7th Saga Cheat Codes Only Work In The Snes9x Emulator? Question : I know a good cheat for 7th Saga that is no listed on this page, Can you add it. Question : Do you have any gameshark pro codes for 7th Saga? I hope this article on 7th Saga (SNES) Cheats + Action Replay | Game Genie Codes has helped you. If you are aware of any tips I have missed off please post about them in a comment below. Please help us out by spreading the word and sharing this article on 7th Saga (SNES) Cheats + Action Replay below.